The Mill dates back to the middle of the 16th Century. In 1707 the Mill had 2 wheels to turn the machinery and 4 areas for cleansing the cotton, also known as Fulling Stocks. The Mill was expanded by 1788 to consist of 8 wheels and 5 fulling areas. They also added some grinding areas too, making this Mill the largest in the world. Work in the Mill was messy and dangerous. The cotton would arrive dirty and would need to be washed and hammered. The cotton would be soaked in water, urine and clay. The Mill changed hands over the years, and had to be completely rebuilt in 1804 after a massive fire. These old mills were often fire hazards. 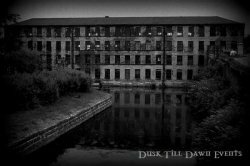 The working conditions within the Mill were so terrible that it was locally known as the ‘Dark Satanic Mills’. The minimum age for those sent to work at the Mill was 9 years old, and they would be expected to work a 48 hour week, although there are records of children as young as 6 working 70 hours weeks! The small stature of a child meant it was easy for them to fit under the machinery, and their small hands could unblock machines. Of course if the child was not quick enough, they could very well then get caught up in the machines, girls would struggle under the machines, but had to take special care for their hair not to get sucked up in to the machines where it would be easy for them to be scalped. There are some spirits who try and make their presence known to almost everyone who enters the building. The first of these is a man in a top hat and cape. He is seen as a dark shadow figure, clearly seen walking the floor, observing all who enter. Women have been seen within the Mill, walking and talking to each other like time had stood still. Another woman has been seen as clear as the living, asking for her child and if anyone has seen her. The voices of children can be heard, along with their cries. 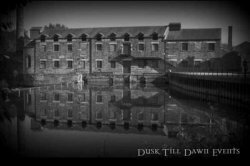 The dark brings out all the noises and horror of the working conditions of the Satanic Mills.